External Affairs Minister Sushma Swaraj, who reached Beijing on Saturday evening, will be holding a crucial bilateral talk with her Chinese counterpart Wang Yi on Sunday evening. External Affairs Minister Sushma Swaraj, who reached Beijing on Saturday evening, will be holding crucial bilateral talks with her Chinese counterpart Wang Yi on Sunday evening. The Union Minister, who is on a four-day China visit, is expected to take up a range of issues with Wang. These include border dispute, China-Pakistan Economic Corridor (CPEC) and China’s repeated blocking of India’s entry into the Nuclear Suppliers Group (NSG). Sunday’s meeting with Wang will be Swaraj’s first since the Chinese Foreign Minister was elevated to a more powerful position in the Chinese political establishment. Wang was in March promoted to China’s top diplomatic post of State Councillor. Their last meeting was in December on the sidelines of the BRICS Foreign Ministers meet. Reports indicate that China will likely continue to persuade India to become part of its ambitious Belt and Road Initiative (BRI) but India’s reservations about the flagship project, China-Pakistan Economic Corridor (CPEC), remain. New Delhi has been objecting to the CPEC because of the threat it poses to India’s sovereignty and territorial integrity. A part of the CPEC cuts through Pakistan-Occupied Kashmir. Swaraj’s China visit comes a week after India’s National Security Advisor Ajit Doval met China’s senior-most diplomat Yang Jiechi in Shanghai. During her stay, the EAM is expected to “reset” ties between New Delhi and Beijing that were strained by the 2017 Doklam crisis. The military standoff that lasted 73 days brought the ties to a nadir and alarmed many of a repeat of the 1962 war. Swaraj’s visit comes in the backdrop of certain ‘moves’ by the two nations towards each other. In March this year, Beijing agreed to share Brahmaputra River data with India. China had withheld the data following the Doklam crisis. On the other hand, New Delhi didn’t allow Dalai Lama to host a ‘Thank You India’ event in New Delhi. The Tibetan spiritual leader is a “separatist” in the eyes of the Chinese establishment. The event, which was attended by BJP’s national general secretary Ram Madhav and Union Culture Minister Mahesh Sharma, was held in McLeodganj in Himachal Pradesh on 31 March. But India has also been increasingly showing its willingness to become a part of the US-Japan-Australia bloc to counter China in the Indo-Pacific region. Swaraj’s visit is being seen as preparing the ground ahead of Prime Minister Narendra Modi’s possible trip in May. PM Modi’s yet-to-be confirmed bilateral meeting with Chinese President Xi Jinping – after he became the ‘eternal president’ – may help in re-strengthening of the ties between the two economic giants of Asia. Reports say the meeting may take place in central or southern China. The Indian PM is scheduled to visit Qingdao in north-eastern China, near the Korean peninsula, in June for the 2018 Shanghai Cooperation Organisation (SCO) summit. Pakistan is one of the member states in the eight-nation SCO. Afghanistan, Belarus, Iran and Mongolia have an observer status. 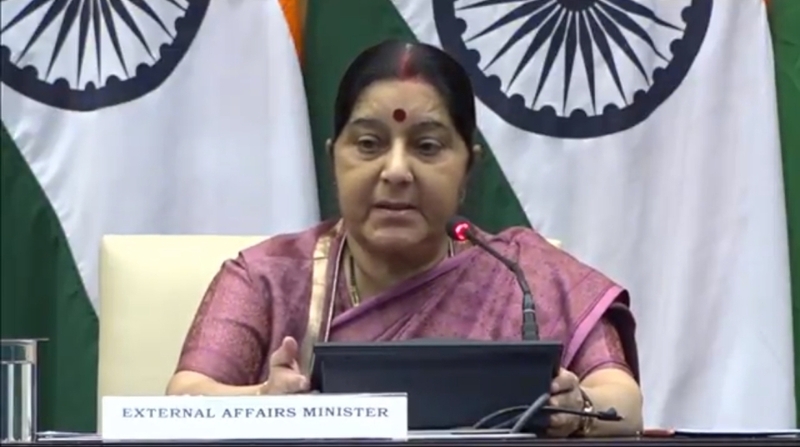 In China, Swaraj will also attend the SCO ministerial-level meeting on 24 April before leaving for Mongolia for a two-day visit – a first by an Indian EAM in 42 years.